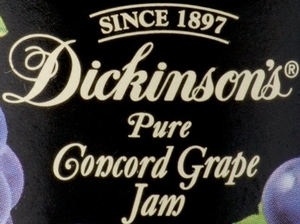 Indulge your guests with the full-bodied flavor and outstanding quality of Dickinson's pure Concord grape jam. 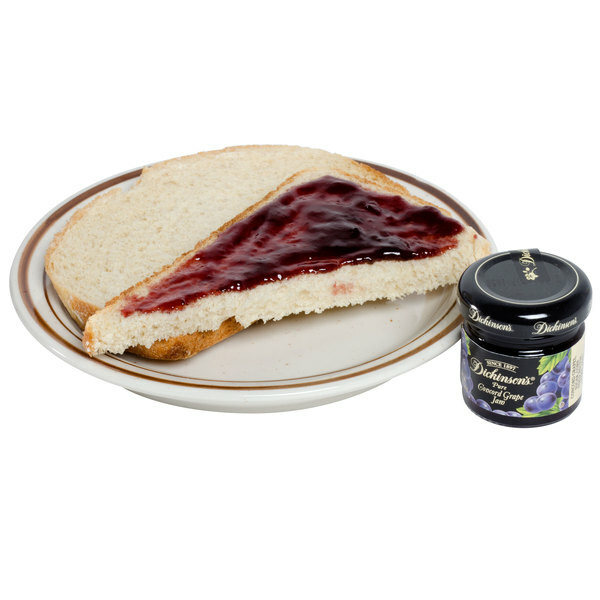 Unlike jelly or preserves, this jam comes from freshly crushed fruit for a tasty, healthy alternative! Whether you're using it as a spread, a side, or even an ingredient in a deliciously fruity cocktail, this jam is sure to please. A high quality product at an affordable price, this jam is the perfect addition to exclusive breakfast services or in-room dining! "Dickinson's pure grape taste great. Its a perfect size for our table and the costumers like them better then the cheap plastic cups. Nice value." 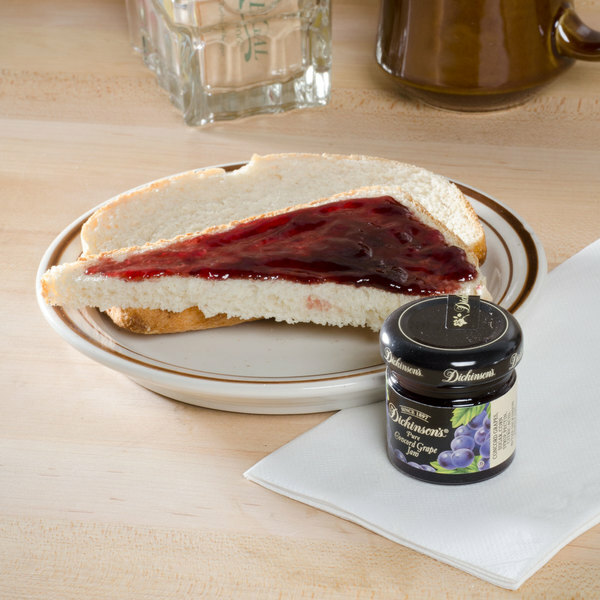 Made from premium red grapes, this delectably tart and saccharine spread bursts with fresh-from-the-vine flavor. 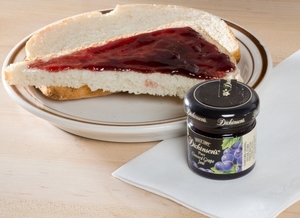 Dickinson's grape jam is the perfect blend of tangy and sweet that your guests are sure to enjoy! This product is conveniently preserved in a perfectly-portioned 1 oz. glass jar, giving it a pronounced boost in elegance over traditional plastic packets. The reliable container allows this high-quality jam to maintain its delightfully fruity taste while complementing the refined atmospheres of the world's finest restaurants, hotels, and catered events. Since 1897, Dickinson's has been the leading American brand of gourmet preserves, syrups, and honey. With its "American Gourmet" character, premium varietal fruits, and pure, high-quality ingredients, this product of the Pacific Northwest makes it simple to bring a home-grown, family-made recipe to your operation! 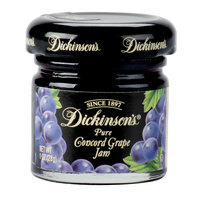 Great packaging on the Dickenson's Concord grape jam. The little glass jars are precious and the grape jam is some of the best I have ever eaten. Dickinson's is a new brand for us but we're pleased with it, we love the cute little jars and customers love them too, especially the convenience factor. 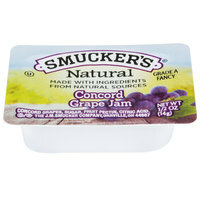 Great brand of concord grape jam. The glass mini jars are a great option for packaging and make a nice, classy display on our condiment table. The grape flavor is great and perfect on toast. Dickinson's is a fine brand of jelly and preserves that is delicious. They used fresh great tasting ingredients. I love their mini glass jars for packaging. The Dickinson's concord grape jam is thick and sweet making for a great spread for our bagels. The mini jars are perfect and really adds to the bagel experience at our shop. Hello delicious! The Dickinson's 1 oz. Pure Concord Grape Jam - 72/Case is pretty high quality stuff and only this much for more than half a gallon of individually sealed glass jars that I can keep afterwards, uh oh, I'm in heaven! 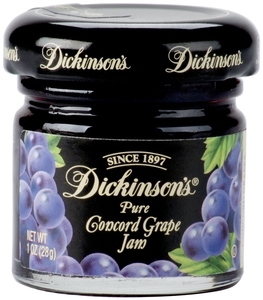 A great iconic jam flavor with the pure concord grape from Dickinson's. The jar is a great way to packaging the jam and really adds a special touch. Great for our biscuit baskets. 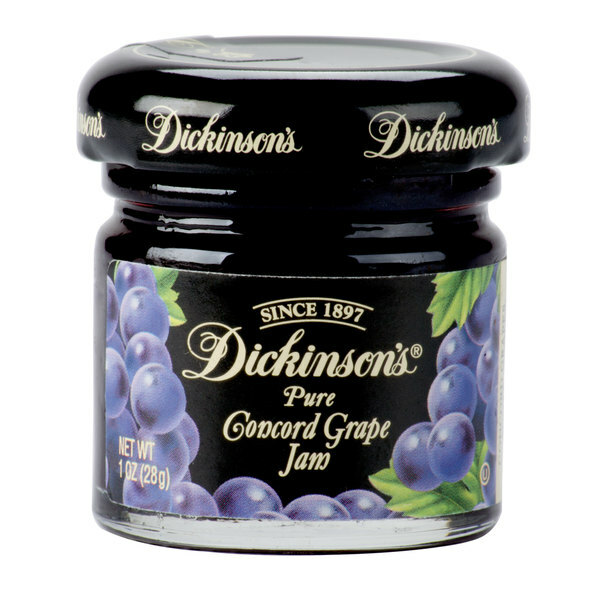 Dickinsons 1 ounce pure Concord grape jam. When delivered will arrive 72 jars in a case box. 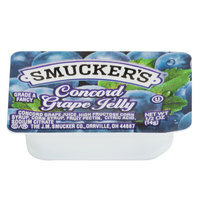 Concorde grape is one of the most recognized jams. 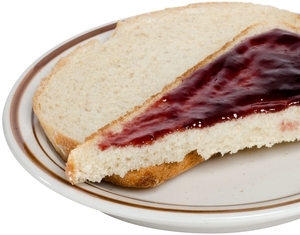 Can be used for peanut butter and jelly sandwiches or combined with butter on toast. It is hard to find the words to explain this jam. It smells amazing and it is mouth watering. It doesn't have a huge sugary taste to it and it is compared to any well known company in taste and quality. This small glass jar is too cute and the grape jam inside is divine. They are perfect for bridal brunches add a nice elegant touch to the buffet. Is it just me or doesn't toast taste so much better when using the little jars of jam? They are adorable and people love them. They dickinson's jams all taste great but their grape is superb. Love these small glass bottle jars of jams. The glass jars are of nice quality, and the guest absolutely love them. The taste of the jam is superb. The flavor is fresh and customers always ask for Dickinson's products over anything else. Great for continental breakfasts, breakfast buffets, and more. Great tasting jam, and love the little glass bottles. Really look nice and polished on tables versus the traditional plastic jelly packets that you find everywhere. These jams are delicious, but a bit on the pricey side. I would recommend trying the dickinsons products in the packets as a good alternative. This super quality product is much less expensive than the size case we get through our usual suppliers. Perfect for breakfast or brunch. Highly recommend! Top notch quality jam adds a really nice touch whenever used. I always take note of food service establishments that spend the extra money to get quality products and patronize them more frequently as a result. 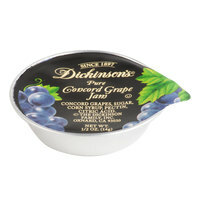 Dickinson's pure grape taste great. Its a perfect size for our table and the costumers like them better then the cheap plastic cups. Nice value. This is one of 3 jams and marmalade jelly that we bought for use in our gourmet baskets. I this is the best flavored grape jam I have ever had. I debated on the fact it is such a common flavor but decided to go along with it because of the color of the label. I wanted my basket to have different colors to make an impact with a fruit and gourmet basket. I am so glad I took a chance. These are very fancy looking and the customers love the small size. The customers always want to take extra ones when they leave so buy an extra case. 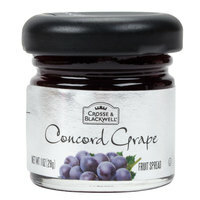 The flavor of the concord grape jam is rich without being too cloying sweet. It's the perfect addition to any breads and in the 1 oz. size it's ideal for a single serving.